One of the things I had hoped to see when I visited the Palouse area of southeastern Washington was a canola field. Canola blooms bright yellow, and is something I wouldn’t see in the farm fields near where I live in Indiana. As my flight made its final descent into Spokane, we happened to fly over a blooming canola field. As I looked across the horizon, I could tell it was the only one visible. It was somewhat northeast of Steptoe Butte, the only landmark I could recognize from the airplane. Later that day, I was on Steptoe Butte, and I could just barely see the field far away across the hills. It was certainly northeast, somewhere near Tekoa, Washington. I decided to try and find it the next day. I made my way toward Tekoa, and as I got closer, I started looking for gravel roads that led up to the top of hills. From the top of a hill, I spied the field again — I was getting close, so I kept headed in that direction. I ended up on a dirt road, one that wasn’t in great condition. 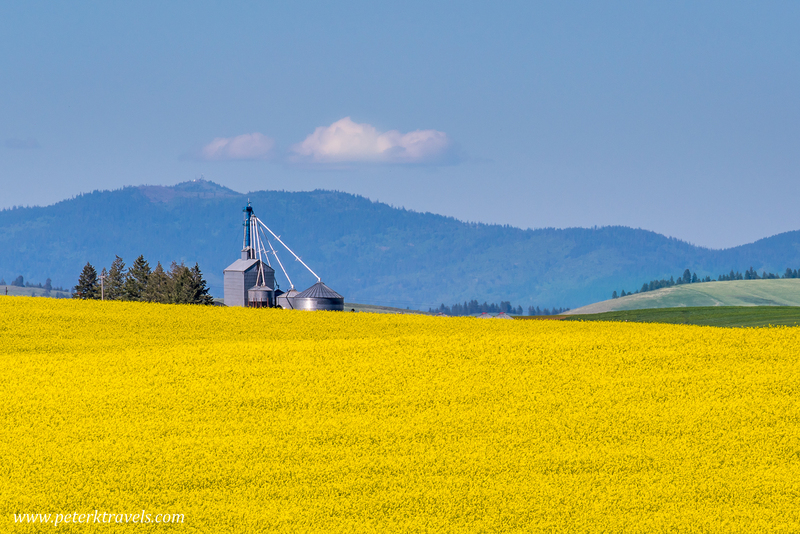 I crept up to the top of the hill in low gear, and in front of me, the canola field. It spread across what looked like miles, bright yellow. It was quite unlike anything I’d seen before. I’ve seen yellow sunflower fields — but in those fields, each plant was more distinct. This was more of a carpet of bright yellow. I struggled a bit to photograph it — I needed a subject. I ended up focusing on a grain tower somewhere in the distance. The photo is below. I took a few closer up shots as well, which I might share in another post. I’m glad my persistence paid off. It took a little effort to find this place, but it was well worth it.